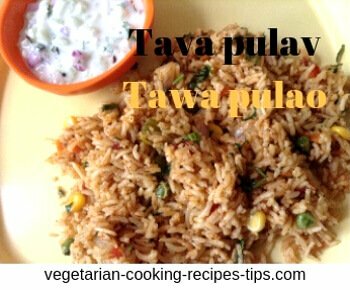 Mumbai Tawa Pulao or Bombay tava pulav recipe with easy step by step pictures of the process. Mumbai is known for it's street food such as pav bhaji, vada pav, misal pav, bhel, pani puri etc. since a very long time. 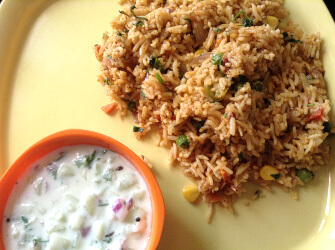 This tawa pulao / tava pulav is a comparatively recent addition to the street food menu. Otherwise earlier, rice/pulao was not a very preferred option to eat as street food in Mumbai. Tawa pulao has changed that trend. Now people love to eat tava pulao on the streets. Tawa pulao is made on a large tawa / flat iron pan in the streets, the same tawa that is used to make pav bhaji. A variety of vegetables are cooked with spice blends such as pav bhaji masala or garam masala or a combination of different masalas by vendors in front of customers. Precooked basmati rice is added to this veggie spice mix along with butter and served hot. The combination of spices may differ from vendor to vendor. 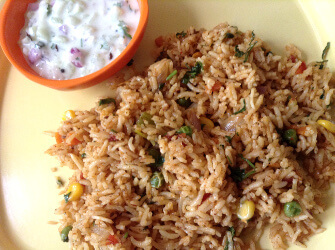 At home, we do not have such large tawas so we use a fry pan or a kadai/wok to prepare this yummy tawa pulao. It is a quick cooking one dish meal, a favorite with my family. 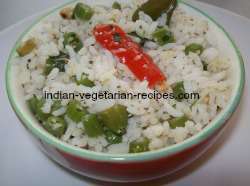 It is quick cooking as you already have cooked rice ready. Cooking veggies with spices takes just a few minutes. It can be eaten hot or at room temperature. You may pack it for lunch to school or office. 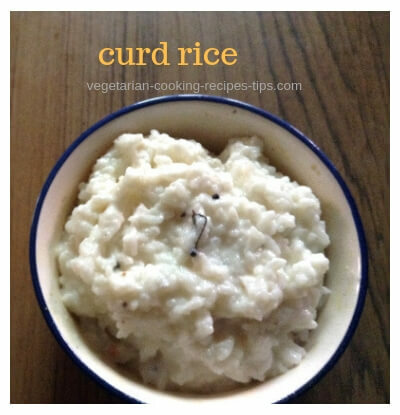 Serve it with your favorite raita or plain curd / yogurt. 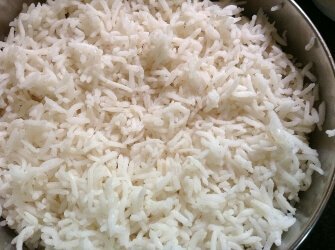 Usually basmati rice is used, but you may use your regular white rice if you wish. 1. 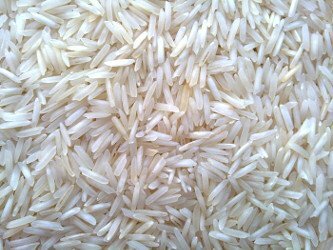 Cook basmati rice as per the instructions given rice cooker / pressure cooker or on the stove top. Do not overcook it. Add a little less water than you add usually. Rice should be just cooked but not at all mushy. 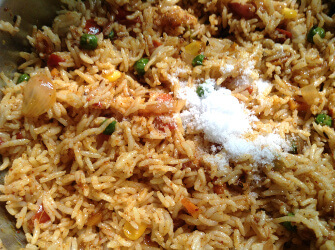 If using basmati, you will need to handle rice carefully as basmati breaks easily. Cool cooked rice to the room temperature. 2. Heat butter and oil in a pan or kadai. 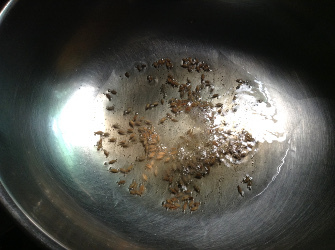 Add jeera (cumin)seeds and let them splutter. 3. 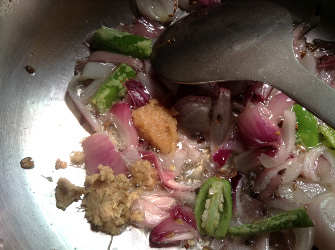 Add chopped onion and green chili (optional). 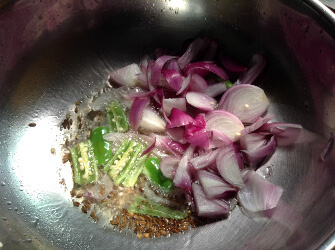 Stir fry till onion becomes transparent. I add green chili because family likes it spicy. 4. When onion looks transparent, add ginger and garlic pastes. Continue cooking. Cook for 1 minute. 5. 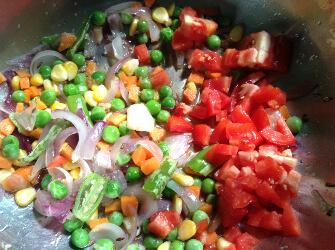 Add chopped carrots, peas, corn and chopped tomatoes. Cook till tomatoes look cooked and soft. You may cover the pan to cook fast. 6. 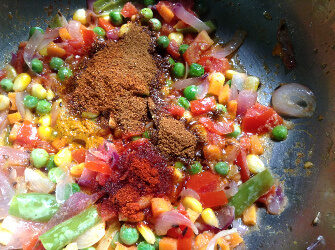 Add pavbhaji masala, garam masala (I added), turmeric powder and red chili powder. Mix well. 7. Cook covered for 2 minutes. 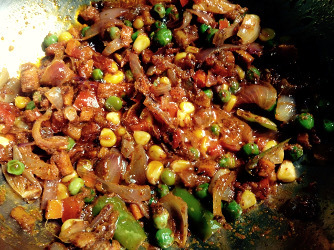 This is how the vegetable and spices mixture looks after 2 minutes. 8. Add cooked and cooled basmati rice to the cooked vegetable/spice along with salt according to taste and mix carefully. 9. Cook for 2 minutes. 10. Add chopped cilantro (green fresh coriander leaves). 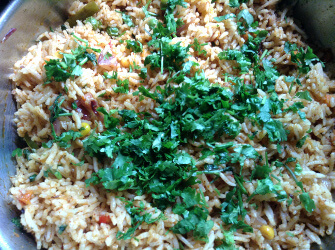 Bombay tawa pulav - Tava pulao is ready. Here it is served with cucumber and onion raita. Adding onion and garlic adds to taste but you may omit it if you wish. 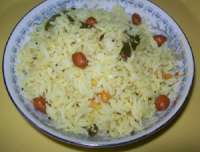 Serve tava pulao hot or at room temperature. This stays good in fridge for 2-3 days. Just reheat before serving. A good dish to take for lunch to school, office or a picnic.